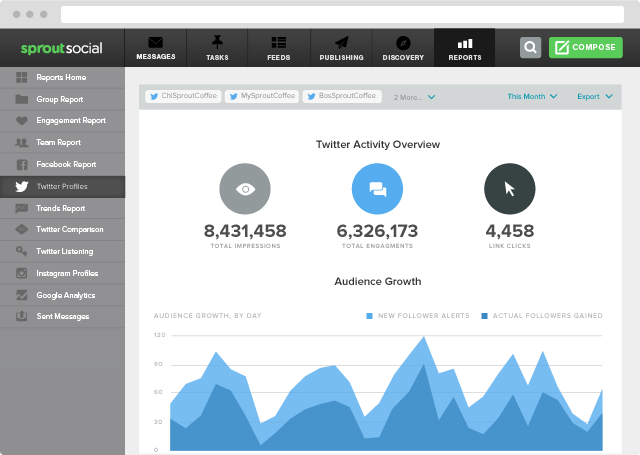 In order to truly understand your audience, you need to track your Twitter followers. That means tracking who’s following and unfollowing you, what they’re Tweeting about, their demographics and everything in between. All of this information will allow you to retain your current followers, as well as attract new ones. In case you’re still not convinced, here’s a look at some of the top reasons every brand should track Twitter followers. One of the most common reasons brands want to track their Twitter followers is to see who’s unfollowing them. A lot of focus is put on how to get new Twitter followers, but what about keeping the ones you already have? In order to truly grow your audience, you need to keep your current followers engaged enough to stick with you. Otherwise you’ll just be stuck in a constant cycle of trading out old followers for new ones. Tracking your followers on Twitter will allow you to see how many people you’re losing weekly or monthly. A word of caution: This doesn’t mean you should hunt down everyone that unfollows you and get defensive or beg them to follow you again. That’ll make you seem desperate for followers and attention, which will only turn people off even more. But here’s where the information comes in handy. Let’s say an important client or customer unfollows you. That might be something to look into. Or if one of your most loyal brand advocates that constantly shares your content unfollows you, it’s worth exploring. Like we mentioned earlier, you shouldn’t freak out every time someone unfollows you on Twitter. You’ll drive yourself crazy if you stress out when your follower count drops by one or two people. Here’s what to do instead. When you track Twitter followers, don’t just look at each individual unfollow—look for trends. If you notice mass people unfollow you during a certain period of time, you can do an analysis or audit of what might have caused the drop. Just knowing that people are unfollowing you isn’t nearly as helpful as understanding the reasoning behind it. Maybe the accounts were bots, or a negative story broke in the news about your brand. Or it could be a sign that the content you’re sharing doesn’t resonate with your audience. Unless you’re actively tracking your followers, it’s easy to miss trends like this until it’s too late. The sooner you can diagnose the problem, the quicker you can address it. In addition to seeing who’s unfollowing you, tracking your Twitter followers will also let you see how your audience is growing over time. 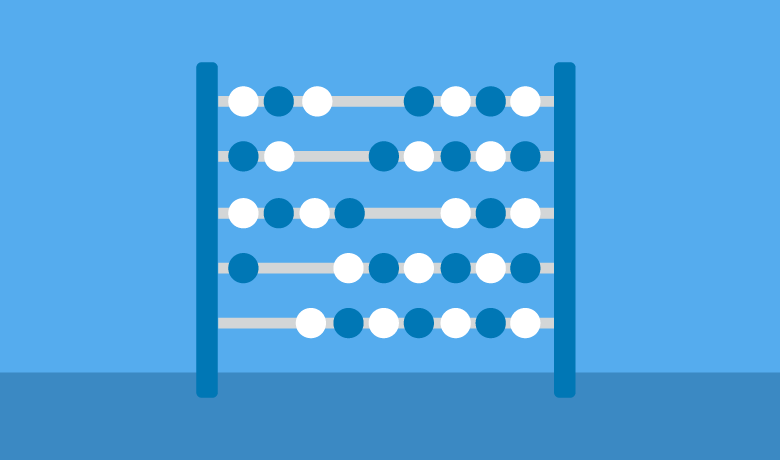 Some brands set goals to grow their audience by a certain percent each quarter, so tracking your growth allows you to see how you’re pacing towards those goals. Whatever the case, you need to get as much information as possible. If you’re running a Twitter campaign for instance, you can dig deeper to find the specific Tweets people are gravitating to. Hopefully, you’re using some type of Twitter analytics that shows you the engagement of all your Tweets. New followers aren’t always a good sign. Your brand might also be trending for a negative reason, causing new people to follow you to stay up to date on the story. How do our followers feel about our brand? Are your followers talking about your brand? Who are your brand advocates on Twitter? Start by making a list of brand keywords. These are keywords and phrases associated specifically with your brand. That includes your company name, your products and maybe a popular tagline. 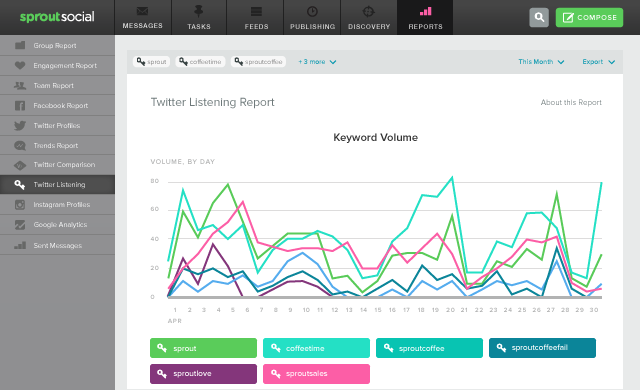 Then you can use Sprout to track when these keywords get used and even create reports to measure your performance. Pay attention to what your followers are talking about, and use that information to improve your Twitter strategy. At times it can seem impossible to get your Tweets seen. Since Twitter moves so quickly, and people follow hundreds or thousands of accounts, engagement has become a commodity for many brands. One way around that is to track when your followers are most active and engaged. You can see this information using Twitter’s native analytics under the “Tweets” tab. This chart shows you which days your Tweets received the most impressions. Take advantage of this by scheduling more Tweets during these specific days. Another good option is to schedule Tweets using our ViralPost feature. This feature automatically schedules Tweets to publish during times when your followers are most likely to be active. Along with figuring out when your followers are the most engaged, you should also track what content they’re engaging with. Instead of randomly sharing content you think your followers want to see, use data to find out the content they actually enjoy from you. 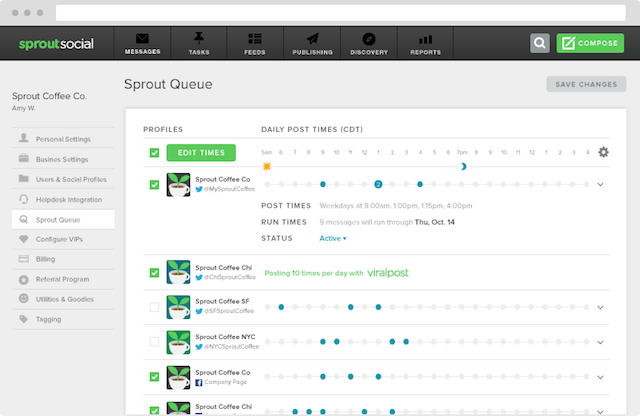 You can do this in Sprout with the Sent Messages report. 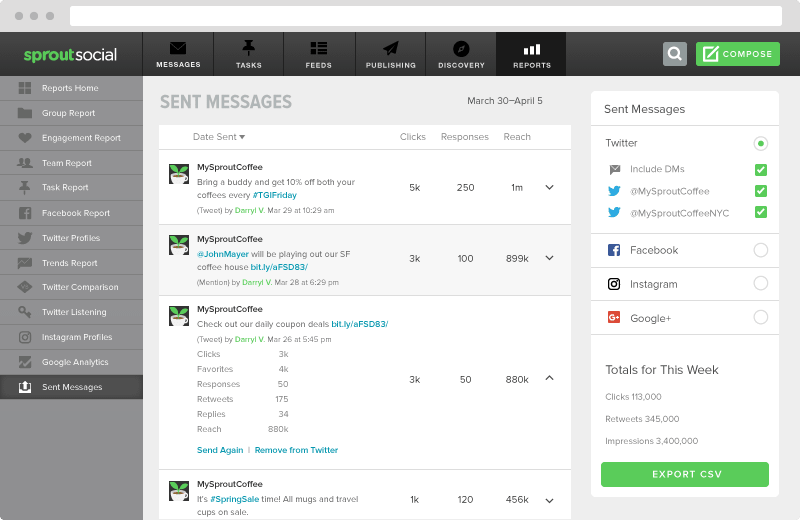 The Sent Messages report details your best performing Tweets. Look for trends in particular topics your audience is resonating with. If you want to get more in-depth, you can use Sprout to tag your messages by category or topic. 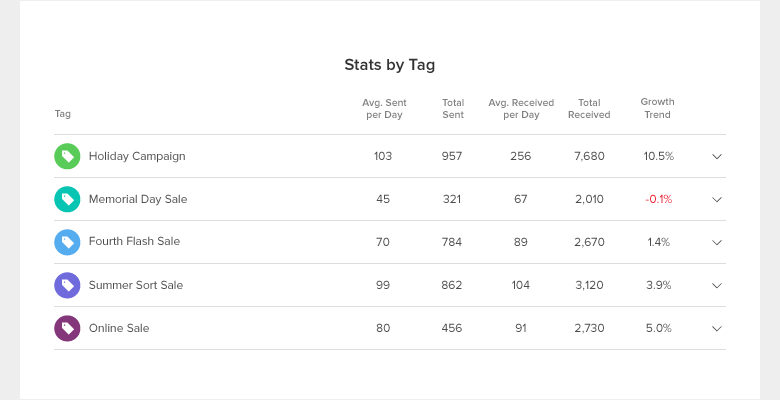 Then use our Tagged Messages Report to analyze which categories your followers respond to the most. The demographics of your Twitter followers today might not look the same as they did two years ago. And it might change again two years from today. As your brand grows and appeals to a wider audience, your Twitter followers might evolve. You want to make sure the content you’re sharing appeals to some of your new followers as well. This is why tracking the demographics of your followers is important. 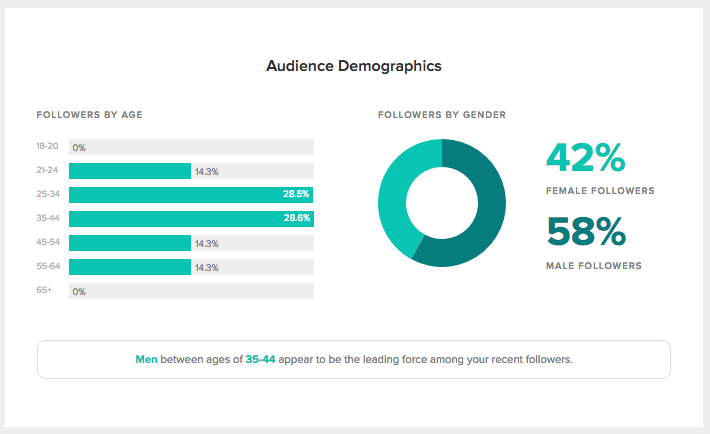 You can use Sprout’s analytic tools to learn about the demographic makeup of your followers such as their age and gender. Use this information to better target your content and speak directly to your core audience. For example, if you’re a fashion brand and notice your audience on Twitter skews toward 21-24 year old females, you might want to share more articles with fashion and beauty tips for young women. But if you’re a skincare brand and you see a growing segment of your audience is 55+ year old male and females, you could try sharing content related to restoring skin and reducing wrinkles. Your content should match the audience you’re sharing it with. A study from the University of Southern California released in early 2017 found roughly 48 million accounts on Twitter are actually bots. To give you some perspective, Twitter currently has a little over 328 million monthly active users at the moment. So even if you don’t have millions of followers, there’s a chance some of your audience consists of bots. Bots don’t necessarily “hurt” your company. Some are even automated to engage with your account. The problem is they inflate your numbers and give you a false sense of your audience size. There are Twitter tracking tools like this one that can help you estimate the number of fake followers/bots in your audience. The numbers won’t be exact, but you’ll at least have a general idea. Don’t be alarmed if you have a small percentage of fake followers. Bots often follow random accounts in order to look more legitimate. However, if half of your audience is bots, that’s cause for concern—particularly if you didn’t buy them, which is something you should never do. It means you need to start working to attract real followers. Go back to the drawing board an create a strategy to grow your audience. If your brand isn’t keeping tabs of trends and changes in its Twitter followers, you’re opening yourself up to missed opportunities. When you know who’s unfollowing you, what your followers are talking about and the social chatter going on involving your brand, it’s easier to see what’s working and what isn’t. Get started by signing up for a free trial of Sprout. Then uncover all the valuable data you can get from tracking your Twitter followers.